Nopal Cactus is one of 20 raw materials that Seagate produces on their farms and from their fishing operations. The cactus farm is located inland from their factory in Ensenada, Baja California in one of the most arid regions of the world. Typical annual rainfalls average less than 6 inches per year in these inland valleys. The nopal is very well-adapted to this climate, absorbing most of its moisture directly from the humidity in the air and from the early-morning condensation drops of water that stick to its outer skin before sunrise. The nopal is essentially a water storage vessel , a vegetable version of a camel’s hump, that can retain its water inside its leaves for many months, slowly feeding the plant during high temperatures and droughts. 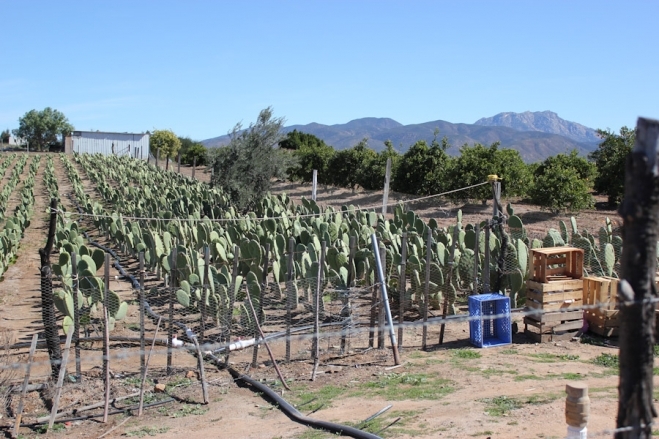 The temperature at this nopal farm typical reaches 110-115F daily during the summer months, when there is no rainfall in this region for at least 6-8 months. The older-growth nopal leaves care harvested from each stalk throughout the year as the production schedule in Seagate’s plant requires raw material. The leaves are cut and brought by pick-up truck for their 30 mile ride to Ensenada and to the factory. At this point the leaves are very heavy, containing 96-98% water, held within a fiber/gelatinous structure of the internal leaf. The leaves that Seagate harvests are approximately 12 to 24 inches in length. The photo above gives the perspective alongside a 12” knife. The nopal cactus leaves are loaded into a stainless steel rotary wash tank where the leaves are tumbled within a bath of water. This agitation causes all the dirt on the leaf’s surface and any remaining cactus spines that survived the truck ride to separate from the leaves and fall through the holes in the stainless plate to the bottom of the tank. 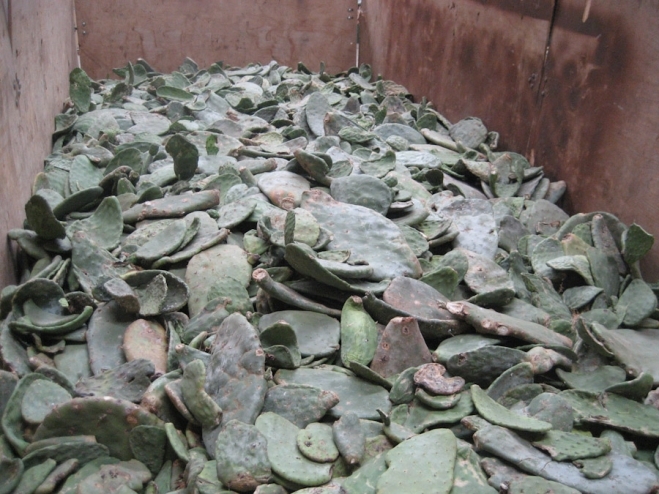 The cleaned nopal leaves are then drip-dried in bins for 15 minutes before being ground into small particles and then loaded into one of the factory’s large freeze dryers. Jose is standing in front of the freeze-dryer #2. This is vacuum tank is 12 feet long and has a 6 foot diameter. It has a capacity to load over 1.5 metric tons of nopal cactus. Once the nopal is loaded, the tank is sealed and all the air is removed. The tank begins a slow retation The resulting vacuum in this tank approaches the vacuum of outer space. 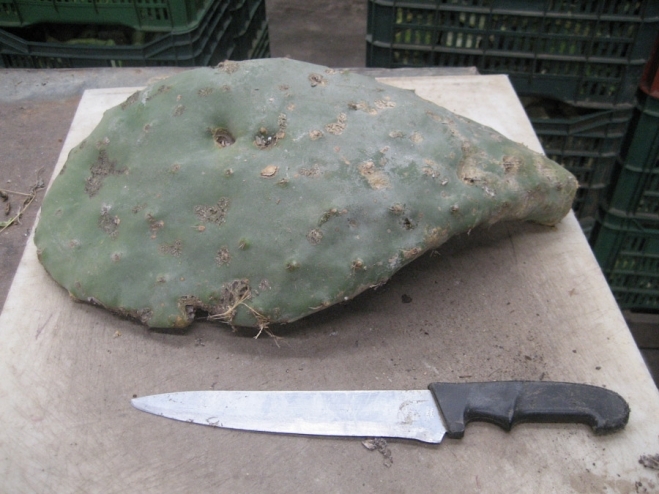 The evaporation of the moisture from the nopal reduces the temperature of the tank and the leaves below freezing. The moisture is slowly and gently removed in this cold vacuum environment, during a 2 to 3 day batch process. Only the moisture is removed, leaving the fibrous gelatinous dried mass of particles. A batch of 1.5 metric tons or raw nopal leaves will yield between 40 to 60 kgs of dried nopal fiber. It is this fiber which gives the nopal its water-retention properties and which in capsule form and taken as a supplement will absorb and retain moisture for a couple of hours in the stomach and intestines, giving you a sensation of fullness thereby helping as a diet aid and for colon cleansing. If everything is running well, then we can take a couple of hours off and visit one of the local events like this year’s Mardi Gras that took place in downtown Ensenada.